SaltFree are a group of freedivers united by a love for plunging into the depths of The National Diving and Activity Centre, a deep, green and unashamedly beautiful flooded quarry near Chepstow. Situated just over the old Severn Bridge, about half an hour from Bristol, the quarry opened as a dive facility in 2003 and is the first of its kind to welcome freedivers. All freediving at the National Diving and Activity Centre is through SaltFree Divers. SaltFree are the largest freedive group in the UK, setup by Samphire Amps, former UK Team Captain and AIDA Freedive Instructor Trainer. Saltfree run regular training meets for qualified freedivers and courses recognised by AIDA and PADI for all levels of freediver from complete beginner to instructor. For those already at the top of their game (or who would like to be! ), we offer performance coaching for those at the top of their game and host records and competitions for all levels. From time to time we also take trips overseas and dive on the coast. 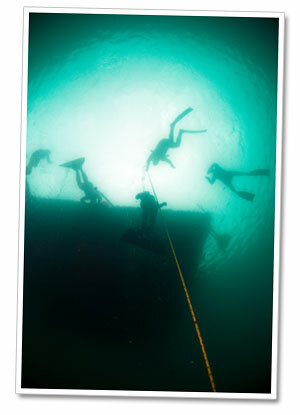 SaltFree meet at NDAC around once a month to train for Constant Weight and Free Immersion Dives. We welcome anyone with an AIDA ** Freediver level of education, and if you don't have that yet, we run courses throughout the year. Dates and information are on our own website. Safety is our priority and we use counterweighted lines for all our deep dives. We always have strong freedive safety divers, first aiders and oxygen providers on hand with all the equipment they need. Please see their own website www.saltfreedivers.com or email [email protected] if you would like further information.